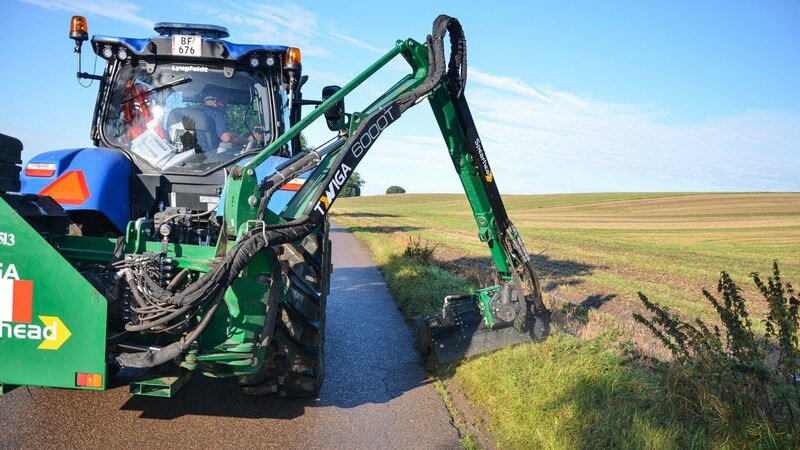 By incorporating the RotorFlex head angling sytem, the machine is able to cut in any position throughout its 155 degree operating plain - even directly behind the tractor. Furthermore, the RotorFlex allows the driver to cut all the way around trees and other obstacles. This option excels when you are using a Quadsaw, as it will be possible to cut brances, no matter the angle. The construction of the Twiga Flex is based on modularity. This provides many opportunities and any customer desire can be fulfilled. The objectives of the development of the Twiga FLEX series was quite clear: Perfect work, long life, low maintenance costs, and above all: Optimum working conditions for the driver. Dual oilflow control. Allows two diffent oilflow settings, when changing between different attachment tools. The Twiga FLEX series offers a working range of 155º, in combination with the Rotor Flex optimum conditions for the driver is archieved as the working tool is always within the drivers field of vision. Reaches up tol 8.9 m.
*** Tractor weight can vary from model to model. Mechanical parallel arm is standard on the Twiga FLEX range. Enables the operator to adjust the reach of the machine without needing to continuiously adjust the lift - ease of use. With special focus on material use the arm is build in 6/8 mm spring steel. In areas where more strength is neede, the arm is more heavily built. Along the arms length extra segments are welded on and insdie reinforcements to prevent any wrenching. The Autopilot automatically steers the height adjustment, giving the perfect ground adaption. Height variation sends a signal through the parallelogramm between the flailhead and the arm to the hydraulic valve, makin the arm raise or be lowered down. This ensures an even weight on the flailhead and reduces wear and maintenance costs. The Autopilot makes the job easier for the driver. Front & reverse mounted reach mower gives a great view and flexibility.